The next generation blockchain built for business, is picking up where others left off. We are busy building a platform with a modern approach. The Ignition Coin launch did not include an ICO to preserve fairness. Mining, Staking, and Master Nodes became accessible from day one with a small development fund built-in. Inflation slows every 1 million coins, only 1 million coins will be generated in the first year with the remaining 4 million over the next 50 years. With a maximum of 5 million coins, Proof of Work, Proof of Stake and Master Nodes - Ignition Coin users who secure the network simultaneously earn block rewards from the network. 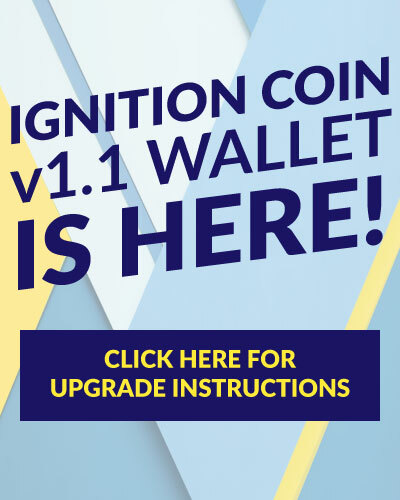 It’s easy to start earning Ignition Coin. You can create a master node through the wallet, stake your coins, or mine the coin. The Ignition Network’s blocks are generated by a triple hybrid methodology – Proof of Work, Proof of Stake, and Master Nodes. This reduces the power cost compared to traditional PoW blockchains by 50%, and eventually, if the community decides, 99.9%. Help secure the Ignition network by operating a Masternode. PoS/PoW block rewards are equal, but POS rewards are split 50/50 w/ stakers & Master Node operators. 50% of all network rewards go to PoW Miners, using the Scrypt algorithm, miners secure the network from the external world. Proof of Work is considered the most proven and tested method for securing blockchains. 25% of all network rewards go to Master Nodes. Master Nodes run full nodes, like stakers, but they hold a collateral value of 3000IC in order to process anonymous and instant transactions for the network. 25% of all network rewards go to Stakers. Stakers run a full node, and hold any amount of coins in their balance for at least 30 minutes to begin competing for new block rewards. Stakers secure the network health by contributing to the distribution of the blockchain efficiently. Keep up to date with the latest happenings from our team. Download the ignition platform white paper. Fully Functional and Secure Wallet. Get Ignition Now! Our team is always busy adding new features, here is just a some of what we have accomplished so far. Get live pricing info on any coin, and navigate Ignition block explorer from within Discord! Our priority is decentralization, and we are now on Crypto-Bridge DEX! A growing decentralized exchange. Our Developers are working on a GUI redesign to aid usability and avoid common mistakes. We have several bounties! Weekly contests, Bug Fix Rewards, and more! The Community as a whole can contribute documentation for our wiki on Github! We have added a developer who exclusively works in mobile development to develop Android & iOS wallets! We are always working hard to make effective and efficient use of marketing - and work with the community when appropriate to help bring IC to more markets. We have 7 developers with extensive programming, development, and managerial skills, as well as several awesome community & auxiliary team members. Available on these exchanges (more coming soon). Ignition combines the best from many different blockchain technologies, while throwing out the rest. Next gen blockchain with proof of stake, proof of work and masternodes.